(This post appeared on our successor blog, The Analysights Data Mine, on Friday, May 9, 2014). As data continues to proliferate unabated in organizations, coming in faster and from more sources each day, decision makers find themselves perplexed. Decision makers struggle with several questions: How much data do we have? How fast is it coming in? Where is it coming from? What form does it take? How reliable is it? Is it correct? How long will it be useful? And this is before they even decide what they can and will do with the data! Before a company can leverage big data successfully, it must decide upon its objectives and balance that against the data it has, regulations for the use of that data, and the information needs of all its functional areas. And it must assess the risks both to the security of the data and to the company’s viability. That is, the company must establish effective data governance. Data has many uses; comes in many different forms; takes up a lot of space; can be siloed, subject to certain regulations, off-limits to some parties but free and unlimited to others; and must be validated and safeguarded. But just as much, data governance ensures that the business is using its data toward solving its defined business problems. The explosion of regulations, such as Sarbanes-Oxley, Basel I, Basel II, Dodd-Frank, HIPAA, and a series of other rules regarding data privacy and security are making the role of data governance all the more important. Moreover, data comes in many different forms. Companies get sales data from the field, or from a store location; they get information about their employees from job applications. Data of this nature is often structured. Companies also get data from their web logs, from social media such as Facebook and Twitter; they also get data in the form of images, text, and so forth; these data are unstructured, but must be managed regardless. Through data governance, the company can decide what data to store and whether it has the infrastructure in place to store it. Many people aware of big data are familiar with its proverbial “3 Vs” – Volume, Variety, and Velocity. But Kevin Normandeau, in a post for Inside Big Data, suggests that three more Vs pose even greater issues: Veracity (cleanliness of the data), Validity (correctness and accuracy of the data), and Volatility (how long the data remains valid and should be stored). These additional Vs make data governance an even greater necessity. 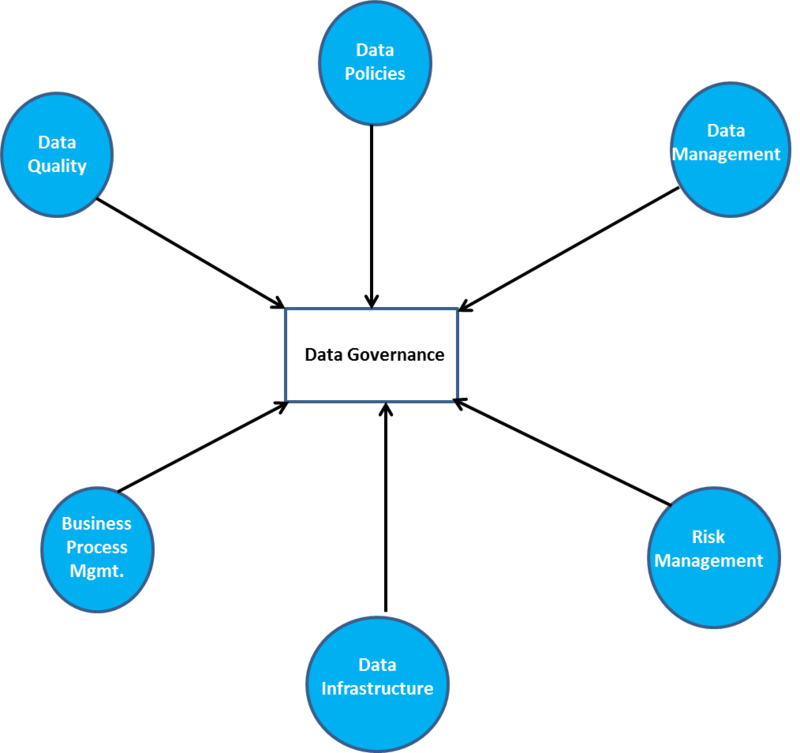 What Does Effective Data Governance Look Like? Effective data governance begins with designation of an owner for the governance effort – an individual or team who will be held accountable. The person or team owning the data governance function must be able to communicate with all department heads to understand the data they have access to, what they use it for, where they store it, and what they need it for. They must also be adroit in their ability to work with third party vendors and external customers of their data. The data governance team must understand both internal policies and external regulations governing the use of data and what specific data is subject to specific regulations and/or policies. The data governance team must also assess the value of the data the company collects; estimate the risks involved if a company makes decisions based on invalid or incomplete data, or if the data infrastructure fails, or is hacked; and design systems to minimize these risks. The team must then be able to draft, document, implement, and enforce its governance processes once data has been inventoried and matched to its relevant constraints, and the team develops its processes for data collection and storage. The team must then be able to train employees of the organization in the proper use and collection of the data, so that they know what they can and cannot do. Without effective data governance, companies will find themselves vulnerable to hackers, fines, or other business interruptions; they will be less efficient as inaccurate data will lead to rework and inadequate data will lead to slower, less effective decision making; and they will be less profitable as lost data or incomplete data will often cause them to miss opportunities or take incorrect actions due to decisions on such data. Good data governance will ensure that companies get the most out of their data. Follow Analysights on Facebook and Twitter! Now you can find out about new posts to both Insight Central and our successor blog, The Analysights Data Mine, by “Liking” us on Facebook (just look for Analysights), or by following @Analysights on Twitter. Each time a new post appears on Insight Central or The Analysights Data Mine, you will be notified by either your Facebook Newsfeed or your Twitter feeds. Thanks! (This post appeared on our successor blog, The Analysights Data Mine, on Monday, May 5, 2014). One misconception about “big data” is that it is only for large enterprises. On its face, such a claim would sound logical; but, in reality, “big data” is just as vital to a small business as it is a major corporation. While the amount of data a small business generates is nowhere near as large as that which a large corporation might generate, a small business can still analyze that data to find insightful ways to run more efficiently. Imagine a family restaurant in your local town. Such a restaurant may not have a loyalty card like a chain restaurant; it may not have any process by which to target customers; in fact, the restaurant may not even be computerized. But the restaurant still generates a LOT of useful data. What entrée or entrees are most commonly sold? What side dishes are most commonly ordered with a particular entrée? What is the most popular entrée sold on a Friday or Saturday night? How many refills does a typical table order? What is the average number of patrons per table? What are the busiest and slowest nights/times of the week? How many tables and/or patrons come in on a particular night of the week? Information like this can help the restaurateur estimate how many of each entrée it must prepare for on a given day; order sufficient ingredients for such entrees and menu items; forecast business volume for various nights of the week, and staff adequately. In addition, such information can aid menu planning and upgrades. For example, the restaurant owner can use the above information to look for commonalities among the most popular items. Perhaps the most popular entrees sold each involve some prominent ingredient. In this case, the restaurant can direct its chef to test new entrees and menu items that feature that ingredient. Moreover, if particular entrees are not selling very well, maybe the restaurant owner can try to feature or promote them in some way, or discontinue the item altogether. Also, in the age of social media, sites like Yelp and TripAdvisor can provide the restaurateur with free market research. If customers are complaining about long waits for service, the restaurateur may use that to increase staffing, provide extra training to the waitstaff. If reviewers are raving about specific menu items, the restaurateur can promote those items or create new entrees that are similar. “Big Data” is a subjective and relative term. Data collected by a small family restaurant is usually not large enough to warrant the use of business intelligence tools such as SAS or SPSS to analyze it, but is still large enough to provide valuable insights for a small business to operate successfully. Now you can keep track of new posts on either Insight Central or our successor blog, The Analysights Data Mine, by simply “Liking” us on Facebook (look for Analysights), or by following @Analysights on Twitter. Each time a new post is published, you will find out about it from either your Facebook newsfeed or your Twitter feed. Thank you for following our blog; we also look forward to following you on Twitter as well! In their 1996 bestselling book, The Millionaire Next Door, Thomas J. Stanley and William D. Danko constructed profiles of the typical American millionaire. One common characteristic the authors observed was that these millionaires “chose the right occupation.” When Stanley and Danko wrote Millionaire, I doubt many of their research subjects were data analysts, predictive modelers, data scientists, or other “Big Data” professionals; but if they were to write a new edition today, I’ll bet there would be a lot more on the list. “Big Data” jobs seem to be “the right occupation” today. In a recent interview with the Wall Street Journal, veteran analytics recruiter Linda Burtch of Burtch Works predicted that job candidates with little familiarity with “Big Data” will face a “permanent pink slip,” while observing that analytics professionals earn a median base salary of $90,000 per year. Ms. Burtch distinguishes between “analytics” professionals (who typically deal with structured data sets) and “data scientists” (who typically work with large, unstructured data sets), when classifying income levels. Data scientists, Burtch Works found, make a median base salary of $120,000. Even more impressive is the median base salaries of entry level professionals, those with three years’ experience or less: $65,000 for analytics professionals and $80,000 for data scientists. At nine or more years’ experience, the median base salaries rise to $115,000 and $150,000, respectively. Much of the reason for the hefty salaries is that companies don’t often understand what skill sets they need. Ms. Burtch mentions this in her comments to the Wall Street Journal, and I indicated as much in a previous blog post. Add to that the fact that needed skill sets are also highly specialized and relatively few professionals have such skills, or a large pool of them. Because of the scarcity, candidates can command such high salaries. For companies, this suggests that in order to get the most value out of a “Big Data” hire, it must first decide the typical projects it will expect the candidate to perform, and then base the required skill set and years of experience accordingly. Then the company can budget the salary it is willing to pay. This will ensure that the company isn’t hiring someone with 10 years’ experience in data analytics and paying that person $120,000 per year just to pull data for mailing lists, when it should have hired someone out of college for about one-third of that. For candidates, the breadth of skill sets employers seek in “Big Data” professionals suggests they can maximize their salaries by continuing to broaden their skills and experience within the data realm. For example, someone with years of SAS programming and SQL experience may branch out to other programming tools, such as R and Python. Or, such a professional may expand his or her skill set by developing proficiency in data visualization tools such as Tableau of QLIKVIEW. Working in “Big Data” may not make someone “the millionaire next door,” but it may bring him or her pretty close. Now you can keep track of new posts on this site and our successor site, the Analysights Data Mine, by “Liking” us on Facebook, or following us at Twitter: @Analysights. Each time we post something new, you will automatically be notified through your Facebook newsfeed or your Twitter feeds. We look forward to seeing you!